Getting embarrassed by all the pizzas being delivered during the week? 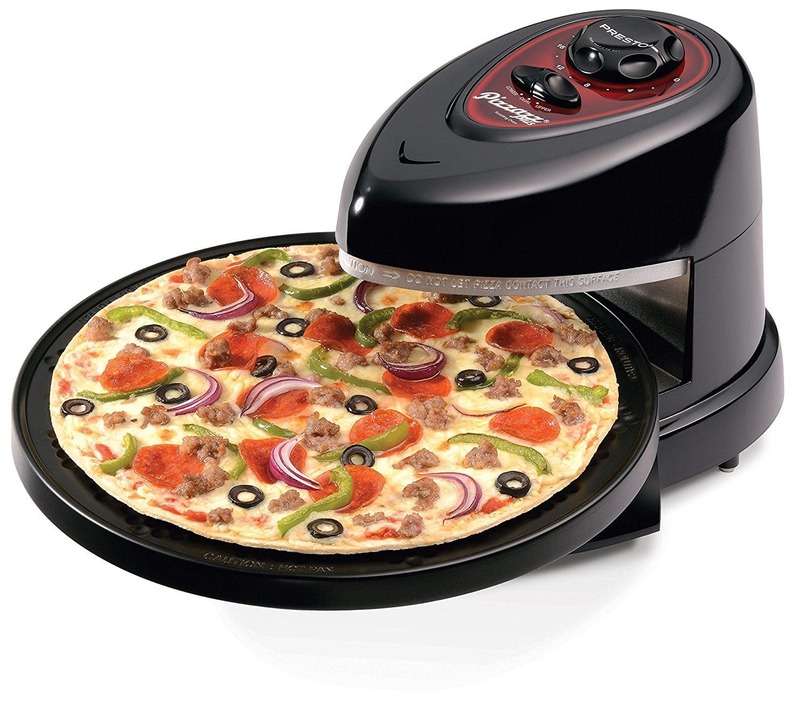 Make ’em at home with one of these killer indoor pizza makers that fit right on your counter! How many pizzas can you eat a week? 2? 10? 15? Sky (and pie) is the limit! We tried making pizza in the oven but, to be honest, it came out like a giant english muffin pizza (read: soggy in the middle and tasting nothing like pizza) so we rolled the dice and went the way of the indoor pizza maker so we could finally master the art of pizza making without having a brick oven (we’re looking at you Oprah!). There’s a variety of pizza ovens out there. Some are open and rotate so there’s even cooking and you can see, immediately, your progress. Others pizza makers are closed for quicker cooking, especially when you’ve added a bunch of toppings. Some even can be used for cooking other things outside of just pizza, which is a total plus. We’ve researched and reviewed some of the best pizza makers (so far) in 2019. This is the perfect pizza maker whether you’re looking to make fresh homemade pizza or need to go the frozen route. You can easily fit a pizza anywhere from 7 inches to around 12 inches in size. What’s super helpful about this little magical rotating pizza maker is that the top and bottom heating/cooking elements are independently controlled to you can choose to have a crispier or doughier pizza. Plus, you can kick up the top temperature as needed for some of those thicker pizza toppings you threw on there. Finally, the baking pan is removable so you can quickly and easily clean it and store it away if you’d like. Average Cook Time: 10-12 minutes. No time to sit around waiting for your pizza to cook in a normal time? Perfect for those late night drunk binges, this indoor pizza oven from Black + Decker will cook up your favorite pizza in just 5-minutes. For real. Insanity. Did we mention this includes frozen and fresh pizzas? Oh, and don’t let the looks deceive you. It’ll cook up to a normal 12-inch sized pizza. We loved the no-brainer easy-to-use pizza settings that you, legit, just turn a knob to set. Choose from: Deep Dish, Rising, Regular & Thin, Frozen, and Bake. It’s honestly that simple. As an added bonus, you can also use this as a snack machine to cook up frozen snacks, baked good and more. Average Cook Time: 5 minutes. This pizza maker is basically a 6-in-1 cooking option. Not only does it make frozen or fresh 12-inch pizzas and flatbreads, you can also make things like cinnamon buns, cookies, nachos, egg omelettes, party mixes, s’more pie and so much more. But, back to the pizza at hand. This one is your best bet if you love a nice and crispy crust. The baking plates are nonstick and coated so the crust is always perfect and it’s a breeze to clean. Average Cook Time: 10 minutes. For a closed pizza maker, we loved that there was a little window on the top so you can sneak a peek on how your pizza is coming along. It rotates for even cooking so no need to worry about those extra doughy or under-cooked spots. Plus, you can adjust the heat to the temperature setting you like so go for extra crispy if needed! We loved that no pre-heating was needed and the tray was removable and dishwasher safe because, let’s be honest, who wants to scrub that in the kitchen sink?! This is a winner for all the brick-oven pizza lovers out there. Sure, it’s minus the actual brick oven, but the built-in baking stone totally helps with that. Plus, that ceramic stone is going to heat up to about 660 degrees (watch your hands!) so it’ll totally give you the taste of must-have brick oven pizza. There’s also three cook settings to choose from: Thick Crust, Medium Crust, and Thin Crust. Once selected it’ll automagically adjust the cook time and the temperature so you can get the pizza exactly how you want it. You can cook a pizza up to about 11-inches in size so it’s slightly smaller than some of the other ones, but an inch less in diameter is really no big deal.